Ponte di Legno, the pearl of Valle Camonica, is surrounded by stunning mountains, such as the groups of Ortles Cevedale and Adamello Presanella. 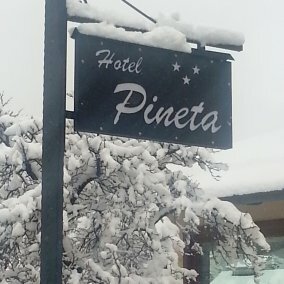 The wide range of ski and snowboard slopes suitable for any level, the possibility of summer ski on the wonderful Presena glacier (3,100 metres high and surrounded by ancient, stately granitic rocks) and the artificial snow system all justify the motto: Ponte di Legno and Tonale, ski all year round. In the lovely resort of Valbione, surrounded by pine trees, there is also a beautiful golf course. Last, but not least, there is the mythical Passo Gavia and its breathtaking views; one of the most challenging climbs in Europe, often on the route of the Giro d’Italia race. 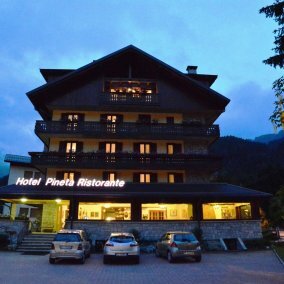 Hotel Pineta is situated at a very short distance from the old centre of Ponte di Legno and just 150 metres from the ski slopes. There's no need to use your car from the hotel: you can walk everywhere in 5 minutes. Within easy reach are the chairlifts and the panoramic cableway, leading to all the ski slopes in the area. In a few minutes, through amazing views of the villages and the surrounding pine groves, you'll be taken to the ski resorts of Passo del Tonale or Valbione and Corno d'Aola, where you'll be able to enjoy one of the most attractive ski areas in Italy. Managed with care by the Longhi family for over forty years, the small, cosy hotel, with its warm atmosphere, is one of the most appreciated in the area; a lot of Italian and foreign guests return every year. The hotel has 18 ensuite rooms with balcony, phone, safe, hairdryer and TV and free Wi-Fi. 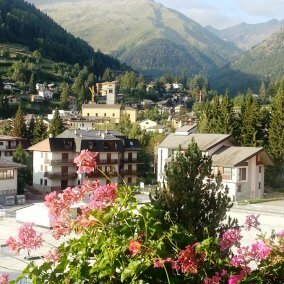 The view from the balconies stretches from the lovely town of Ponte di Legno to the surrounding mountains. The wide and cosy veranda, with its book corner, is the perfect place to spend moments of genuine relaxation. In winter, after a day outdoors, guests can relax over a drink in the warm, comfortable lounge by the beautiful THUN fireplace. Our food is all home-cooked, and very special care is taken over freshness and quality. Our guests can enjoy a wider choice: together with the best of Italian cuisine, we also offer tasty dishes from the local mountain tradition and specialities from nearby Trentino Alto Adige and Valtellina, such as the well-known pizzoccheri. Special attention is given to vegetarian or food-intolerant guests. A Ski storage and a garage for bycicles and motorcycles. A Ski Boot Room is equipped with the first intelligent boot and shoe drying system in the world: very useful for ski boots, tennis, football, golf and trekking shoes. Laundry service on request. 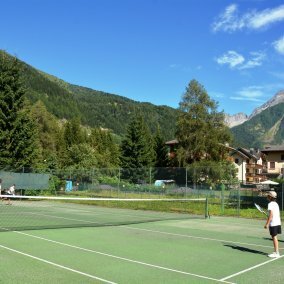 During the summer season, the tennis court opposite the hotel is at our guests’disposal. Free mountain bikes are available at the hotel, allowing our guests to choose from a variety of excursions along the surrounding paths, to the discovery of nearby villages: Temù with an interesting museum on the First World War, Vione with its ethnographic museum so far to the lovely town of Vezza d'Oglio.